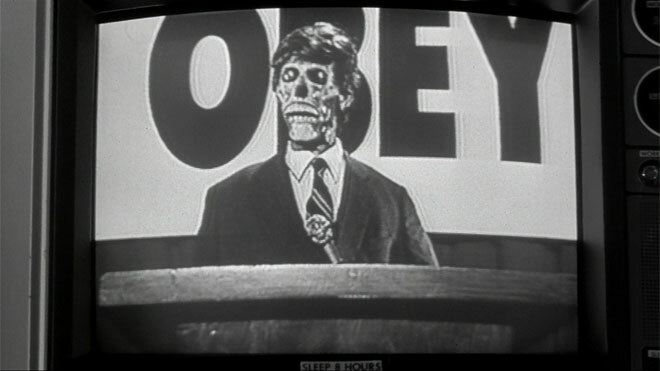 A few years ago I ranted about my fear of a society where the media is absolutely controlled by corporate interests. My head wasn’t in the sand; I obviously realized that we were already living in such a world, as money drives practically everything in this country. I was more concerned with the audacity of the FCC to even consider the type of deregulation it ended up approving. Sure, it happens every day; legislation lobbyed for by those in power increases the empowerment of those same people. I mean, this is how the free market works. But this legislation goes beyond just making money for the upper class. The fact is that Americans are glued to the tube and this type of conglomerate legislation—spanning all media (television, print, radio and the internet)—has now allowed for a greater possiblity to create a lasting, singular, corporate perspective in the psychology of the moment and beyond. Consume messaging has been given even more proximity to our children’s brains. They Live shades are looking pretty good right about now. So without the prospect of landing a pair of alien sunglasses, what exactly can be done to defend ourselves from this destructive approach to creating a consumer culture at all costs? As a contributor to public discourse, I’ve always believed that the ‘net (in 1997), and specifically, blogs (over the last five years) were a key development in the fight to present a perspective to battle corporate marketing and/or government disinformation. This break from the days of publishing via the standard print revenue generation model is something akin to the advent of the printing press, yet with the merchant nation-state taking the place of the previously empowered Church. Okay, maybe that’s a little pre-mature, but the possibilities are there. And what are the possibilities? Over the past few years, the blogging revolution has become more and more accessible and mainstream with the advent of RSS and aggregate readers. With Yahoo! adding access to RSS feeds to their My Yahoo! content modules, blogs are one step closer to being mainstream. But this last step is a big one, steeped in moral conviction. Until blogs are automatically indexed as viable, alternative feeds when running, say, a news query at Google or Yahoo!, they are going to, at best, sit on the periphery of the conscious of the world’s inhabitants. The average person does not have the time, nor the patience, to sift through the pedagogy of managing RSS. Bookmarks are about as much as they can handle. Blogs do return in general search queries, but this “general return only” pre-supposes a value level to the quality of the information being retrieved. You know, a perspective or opinion or even investigative research presented by a blogger has less value than a feed from the New York Times, The Washington Post, etc. That’s why this information retrieval concept would have to be one generated out of moral conviction. By keeping news sources limited strictly to incorporated, staffed and vested (in the economic structure of) newspapers, Google (or any other news search engine) is basically saying that only these sources can report and editorialize news. Even though Google has gone a long way in presenting perspectives from small and foreign sources, providing the chance opportunity for conflicting perspective, it’s still not enough. It seems to me that with a search capability, news aggregator and a blogging tool, Google and Yahoo! are best poised to create convergence between the “professional” news organizations and blogging communities, within the boundaries of their individual interfaces. How accessible blogs become in the presentation, will be a litmus test of their commitment to providing contextual channels within the information age, while creating usable interfaces for digesting a world of information overload and disinformation. It’s completely doable and an ongoing commitment to data mining and information presentation doesn’t seem to indicate that such domains will shy away from heading in this direction. Well, as long as blogs don’t impact their institutional investors or advertisers in a negative light.